For those new to sports betting, Over / Under 2,25 Goals Bet offers an ideal way of securing returns, with multiple winning outcomes from a single wager. 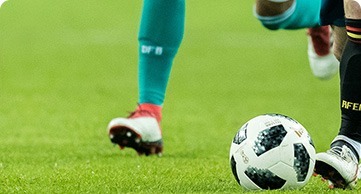 Players can bet on the total amount of goals scored during a match, with lower odds of around 1.80 to 1.90 that can see players almost double up their initial stake, not including bookmaker commissions. One of the simplest systems of betting on football, players can either place a bet on the match goal total, or maximize their chance of returns by playing with Asian Handicaps. What Does Over/Under 2.25 Goals Betting Mean? As with other types of Over / Under betting, Over / Under 2,25 Goals Betting lets players wager on the total amount of goals accrued during a match. Unlike with half goal handicap betting, a 2,25 handicap effectively splits the bet, giving players more possible outcomes to win or lose on. Placing an Over 2,25 Goals bet (also written as 2.25 and +2.25) means that more than 2 goals need to be scored during the match in order to win. If only 2 goals are scored in total, the player loses half their initial bet. An Under 2,25 Goals bet requires more than 2 goals be scored in order to win the bet in full, although a total of 2 goals will mean players receive half of original winnings. How Does the Over/Under 2.25 Goals Betting Work? Betting on Over / Under 2,25 Goals is relatively straightforward. As with all Over / Under betting, players place their wager on a total amount of goals to be scored in any given match. Unlike betting on conventional half goal bets, 2,25 Goals Betting gives players more win outcomes, with players able to pocket half winnings or see half their stake pushed back. Under 2,25 betting offer the most lucrative odds and bigger returns. Premier League match statistics show that the majority of football matches between top-ranking Premier teams result in a match outcome of more than 2.5 goals. Betting on a match outcome of less than 2 goals is higher risk bet on a less likely outcome, with 50% payout of winnings if only 2 goals are scored. Asian Over / Under Betting offers even more ways for players to bet on match and goal outcomes. With this popular system of betting, players can bet on the final goal tally of particular team, as opposed to an overall match goal total. A quarter ball handicap, in this case, +2,25 or -2,25 is applied to a team and the final, adjusted goal score determines the prize payout, push or loss. With Asian Over / Under Betting, if a player bets on TEAM A to win with a -2,25 handicap, they’ll need their favoured team to win the match by at least 3 goals to win the maximum return. If TEAM A wins the match by 2 goals, the player loses half their initial wager. If TEAM A wins by only 1 goal, or the match ends in a tie, the bet is an outright loss. With multiple winning outcomes per individual bet, Over / Under betting offers a relatively low-risk way of profiting on match outcomes. Asian Handicap betting has also introduced more ways to win, with quarter goal handicaps applied to teams to provide more evenly matched odds, and additional bet outcomes. Over / Under betting lets players effectively split their wager into two, turning their stake into a combination of quarter and half goal bets. This provides healthier odds of returns, with each half of the outlaying bet recognized separately. Are There Other Names or Abbreviations that are Used When Referring to Over/Under 2.25 Goals Betting? Over / Under 2,25 Goal Betting is one of the most popular forms of football betting on the web. With so many online bookmakers offering appealing odds on quarter ball betting, it can be tricky to make sense of countless new abbreviations and short-hands. At most betting sites you’ll see quarter ball goal bets abbreviated as 2,25, 2.25 or 2 1/4. Some bookmakers will label bets clearly as ‘Over 2.25’ and ‘Under 2.25’, or simply add a ‘+’ or ‘minus’ or prefix. Applied Over / Under odds will be applied to each match, and usually, be provided next to fixtures and betting stats as ‘1.90’ or ‘2/1’. Anyone serious about amounting big winnings with Over / Under 2,25 Goal Bets should always take into account a few statistics before laying down any wager. When it comes to winning big on football betting, 2,25 Goals (or ‘quarter ball betting’) are a good way for players to enjoy a more flexible bet. Unlike half or whole goal bets, like O / U 1.5, or O / U 2.0, Over / Under quarter ball wagers have multiple win outcomes, including partial 50% returns of wagers (also known as a ‘push’) with Over quarter ball betting, and a 50% claim on total winnings when Under 2,25 Goal betting. Although returns are generally better than half ball betting, it still pays to do some homework to ensure the best possible chance of landing maximum payout on your bet. Match and league statistics are always a good place to start when looking for the best odds and prize outcomes. It’s worth bearing in mind that over half Premier League games finish with more than 2,5 goals, with odds of around 1.90. When it comes to the playing field itself, the best performing Premiership teams have a proven streak of higher goals per game when playing on home soil (odds of around 1.75). Players looking for a relatively secure bet will find safe returns on investment with Over 2,25 Goal Betting when wagering on match outcomes.